Depending on your geographic region or interests, it may be best to contact one of our partners directly. To report invasive plant populations, visit the Midwest Invasive Species Information Network. For garlic mustard, Oriental bittersweet, invasive Phragmites, or giant/Japanese knotweed populations in Grand Traverse, Benzie, Leelanau, and Manistee counties, contact Katie Grzesiak or Fields Ratliff. General questions regarding the Invasive Species Network, Go Beyond Beauty, and other inquiries can be sent to Katie Grzesiak or Emily Cook. Katie is originally from DeWitt, Michigan (near Lansing), but she would rather talk with you about the time she has spent in Michigan’s Upper Peninsula. 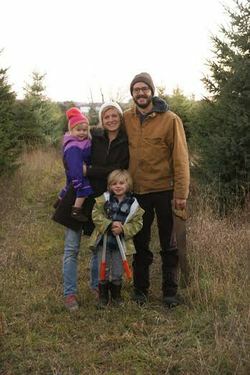 She graduated from Northern Michigan University in 2009 with a Bachelor of Arts in Ecology, and worked for the National Parks Service at Pictured Rocks National Lakeshore on invasive species management for three summers. Katie went on to incorporate this employment into her study for a Master of Science at the University of Michigan’s School of Natural Resources and Environment. During this time, she worked with the NPS for an additional two summers to complete research for her Master’s thesis: continuing a long-term study on the effects of herbicides on spotted knapweed and native plant communities. Katie was thrilled to move north again to work in Traverse City, and enjoys most outdoor activities and a few indoor ones, including backpacking and hiking, camping, skiing, horseback riding, surfing, snorkeling, kayaking, gardening, reading, knitting, and cooking. Emily grew up in Ionia, Michigan, but much prefers the northern woods and lakeshore of the Big Lake. Now calling Arcadia home, she started working with the Invasive Species Network in June 2015. Graduating from Grand Valley State University with a degree in Natural Resources Management, Emily has worked across much of the conservation field spectrum in various parts of the state and country. Jobs with the Nature Conservancy, the National Park Service, AmeriCorps, and a small conservancy in northeast Michigan have led to experiences with invasive species management, trail building, and environmental education. She also gained backcountry leadership and wilderness medicine skills during a course with the National Outdoor Leadership School in Sweden and Norway. Before settling in northwest Michigan to work for ISN, Emily taught field-based marine ecology at Chincoteague Bay Field Station in Virginia. In her free time, Emily loves to trail run, hike, mountain bike, and cross-country ski - anything to get outdoors. She also enjoys reading, painting, baking, staring at Lake Michigan, and spending time with her husband, Joe, and dog, Finn. Fields grew up in Northern Michigan near the south end of Torch Lake and currently resides in Elk Rapids. He received a bachelor of science degree in Environmental Studies from Western Michigan University and is currently working on getting his masters in GIS from Penn State University World Campus. He has spent most of his conservation career working for various organizations in the Grand Traverse Bay Region which has included non-profits, conservation districts, and companies that provide eco-services. In between studying and working in conservation throughout the years in Michigan, Fields has volunteered abroad and has worked as a trail steward in Brazil, an environmental education coordinator in Curaçao, and a farm hand in New Zealand. When he’s not working Fields enjoys a variety of sports and outdoor activities such as hockey, hiking, and boating on one of the regions many beautiful lakes. He also enjoys sharing his love of nature with his wife, Ivy, and two young children Wren and Royal. Audrey graduated from Northern Michigan University in 2014 with a double major in Environmental Science and Writing, and a minor in GIS. She had been bouncing around a couple of states doing field season work, trying different aspects of the environmental field before coming to Traverse City to work for the Grand Traverse Regional Land Conservancy, with the Huron Pines Americorps program. After spending a few months in Traverse City, she was hooked. She wanted to stay in the area for a long, long time, which led to her work in 2017 with ISN, doing invasive species surveys, and her season earlier in 2018 doing invasive species treatments. She loved the people of ISN so much and just had to come back! She is excited to work in the area for another year, help preserve all of the beautiful areas, and work with all of ISN's amazing partners! Andy grew up near Mattawan Michigan. He attended Northern Michigan University, receiving a Bachelor of Fine Arts before continuing his education at the University of Michigan School of Natural Resources and Environment. He graduated with a Masters of Science in Conservation Ecology and Environmental Informatics in 2017. Andy’s work experience includes several years maintaining and restoring the natural areas of the University of Michigan’s Matthaei Botanical Gardens and Nichols Arboretum, leading restoration field crews for the National Park Service, and consulting with private landowners and landscaping companies. When he isn’t outdoors for work, Andy can probably be found hiking, cross country skiing, canoeing, botanizing, mushroom hunting, sketching, or just sitting on a log somewhere in northern Michigan.